We finally left Vaison-la-Romaine for our next stop, L’Isle-sur-la-Sorgue, which literally meant the island on the Sorgue river. We spent the afternoon wandering around town checking out bakeries and getting our bearing. Over the centuries, the river was first harnessed to grind wheat, and then power the textile and paper industries in the region. 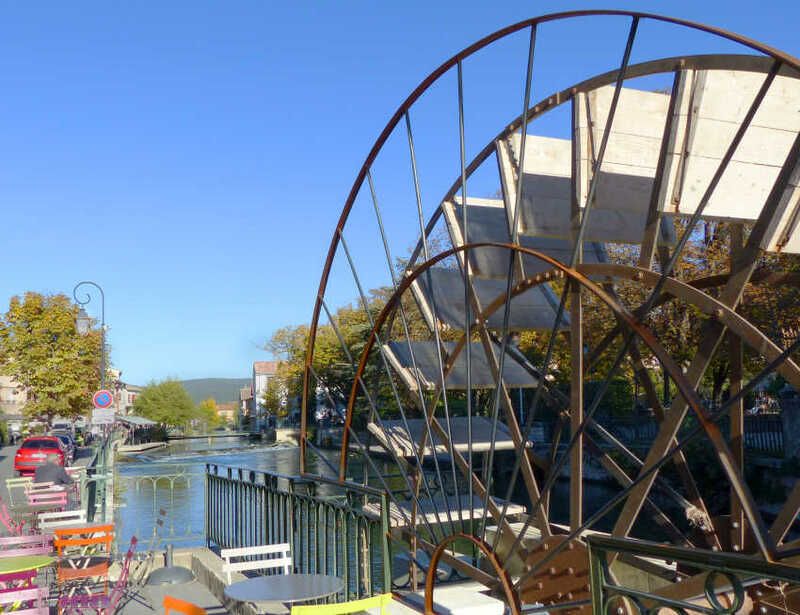 The town, which specialized in silk spinning and dyeing, boasted 66 water wheels in its heyday but sadly only a handful of working wheels remain. Goods and displays from many of the antique/curio shops spill out onto the sidewalk along the main street fronting the Sorgue. 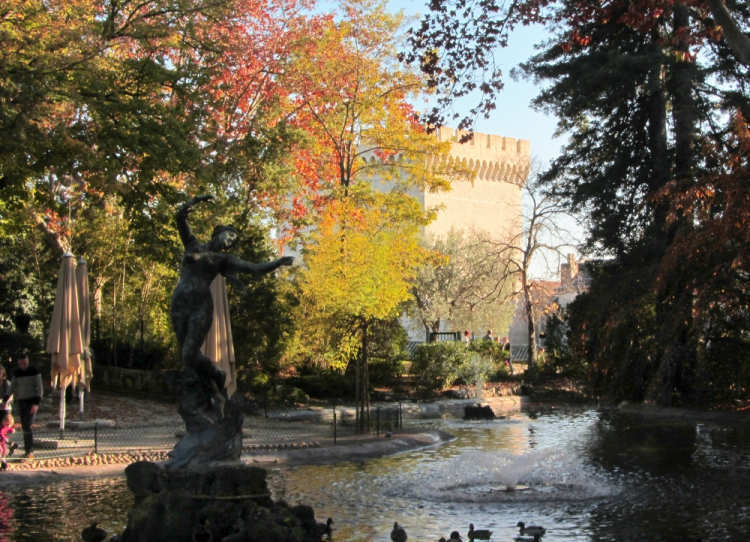 L’Isle-sur-la-Sorgue is, behind Paris, the 2nd largest antique center in France. We walked by converted industrial buildings housing dozens of dealers. 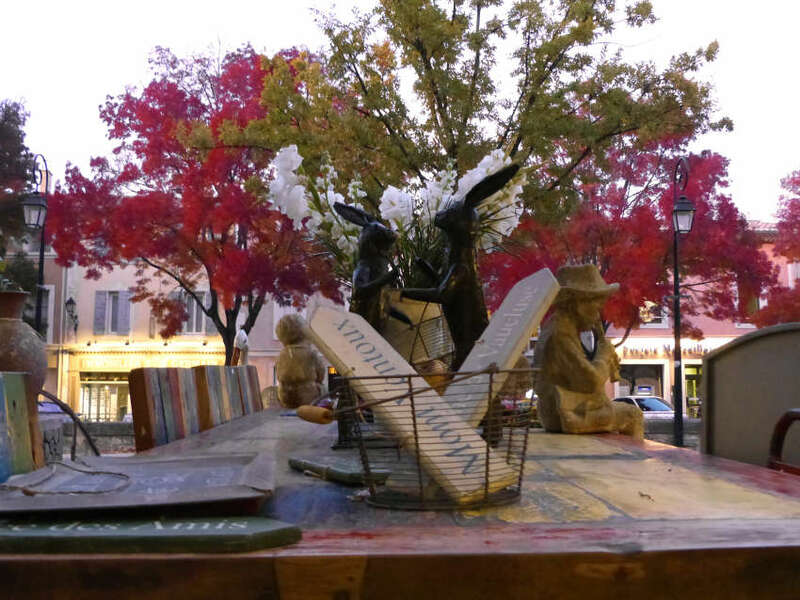 There are also numerous antique and secondhand shops scattered around town. One of water wheels in the center of town. This water wheel doesn’t look operational but makes a great photo op. It’s also in a prime location, right across from a bunch of eateries. We got some glacé and enjoyed our ice cream at a table right by the water. The picturesque fishermen’s quarter is a maze of waterways and small bridges. The abundance of canals earned L’Isle-sur-la-Sorgue the sobriquet ‘Venice of Provence’. 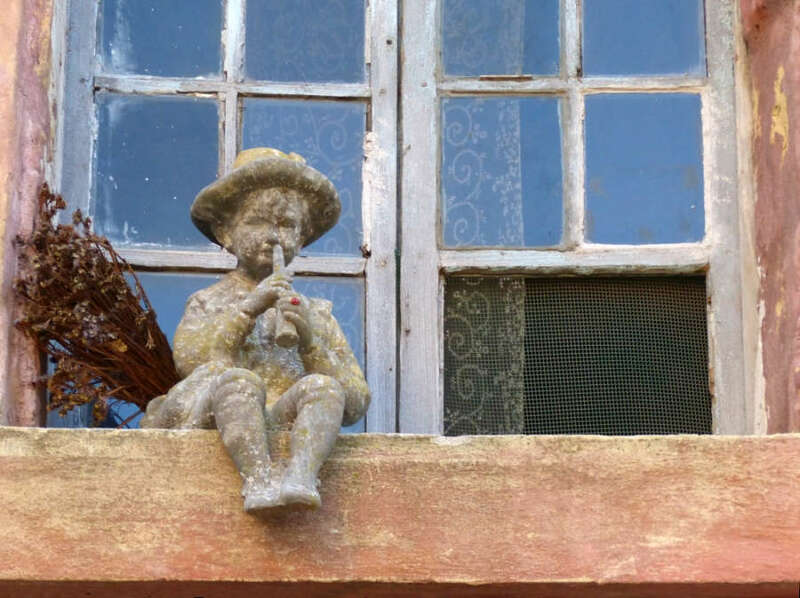 As we wandered the narrow streets in search of water wheels, charming vistas keep cropping up in the quiet alleys. 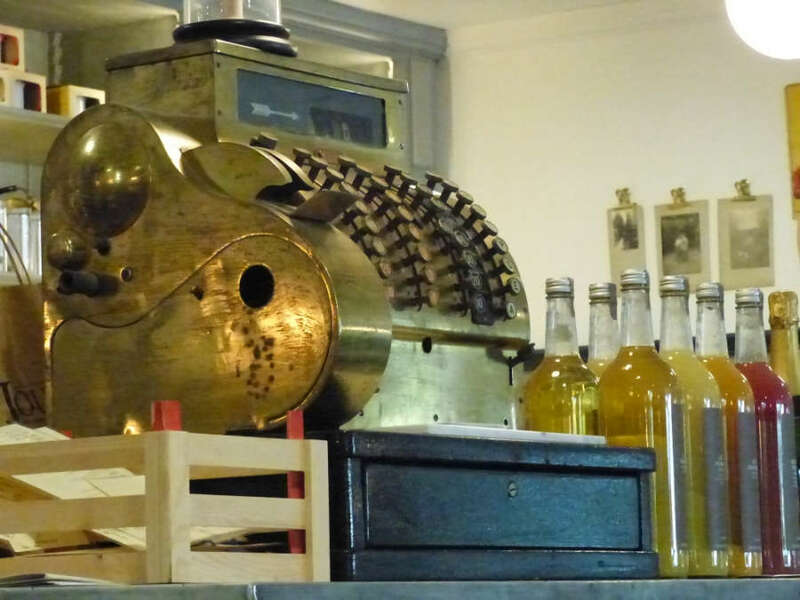 An antique cash register in a popular bakery. All the running around worked up a healthy appetite and we decided to stop by Jouvaud for some sustenance. The brass register in the quirky interior is a nice conversation piece. Sweet temptations on a long trestle table at Jouvaud. 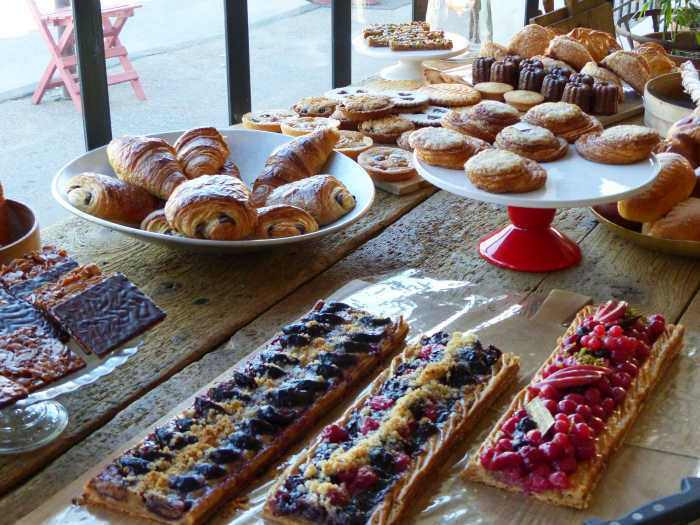 Jouvaud is known for its pastries and we found out the hard way that popular items sell out early. At least we were able to enjoy its pain au chocolat! A welcome surprise in the bucolic countryside. Our quest led us to the town’s periphery. 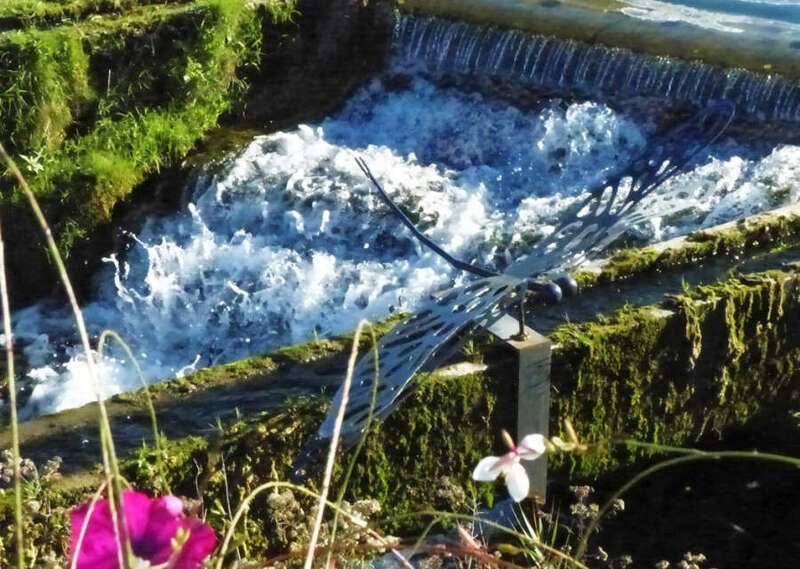 The butterfly sculpture is a fitting piece amidst the wild flowers by the rushing stream. So glad I came upon it: the colors, textures and materials of this still life composition are quintessential Provence! 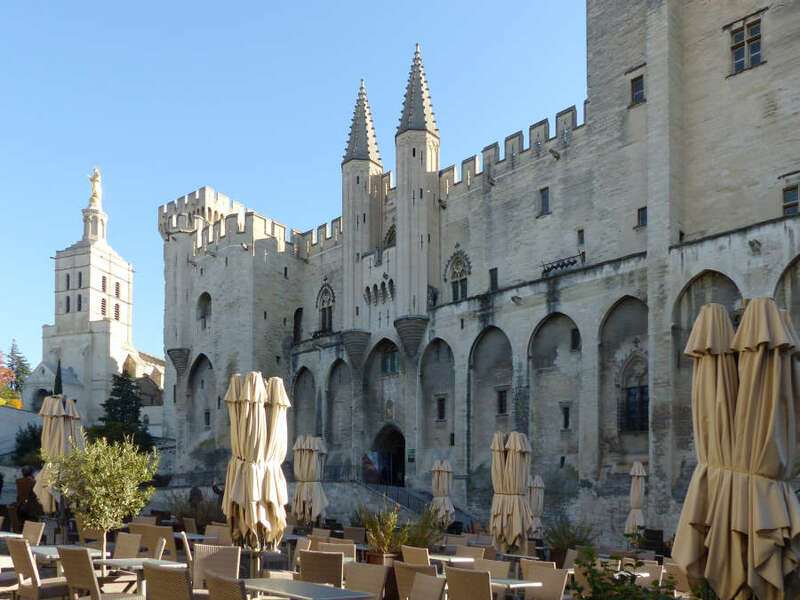 The next day we took an early train for Avignon so as to arrive in time for our 10:30 am Secret Palace Tour at the Palais des Papes (Palace of the Popes). The UNESCO World Heritage Site was the papal seat for Western Christianity during the 14th century and is the largest Gothic building in Europe. This tour gives a behind the scenes look at the papal residence, including secret staircases and hidden corridors in addition to the Pope’s private quarters. Umbrella dotted cafés create a festive atmosphere around the Palace. At this early hour, even the cafés were just setting up – perfect for taking pix without the crowds. An itinerant entertainer dressed in his Sunday Best. 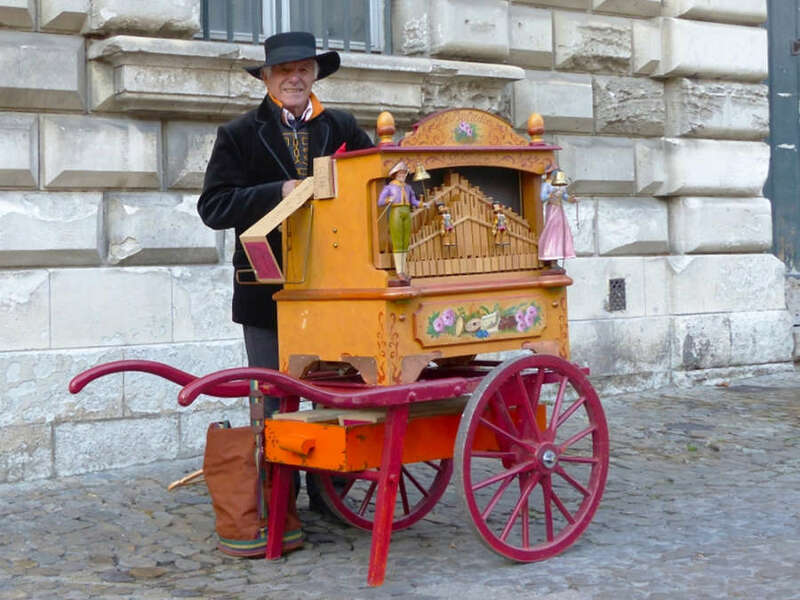 Across from the Palace, a street performer was cranking out traditional French tunes with his colorful and decorative music cart. Bird’s eye view from the rampart. Built as a fortress, the Palace ramparts are some of the highest points in the city, so on a sunny day one can see for miles. 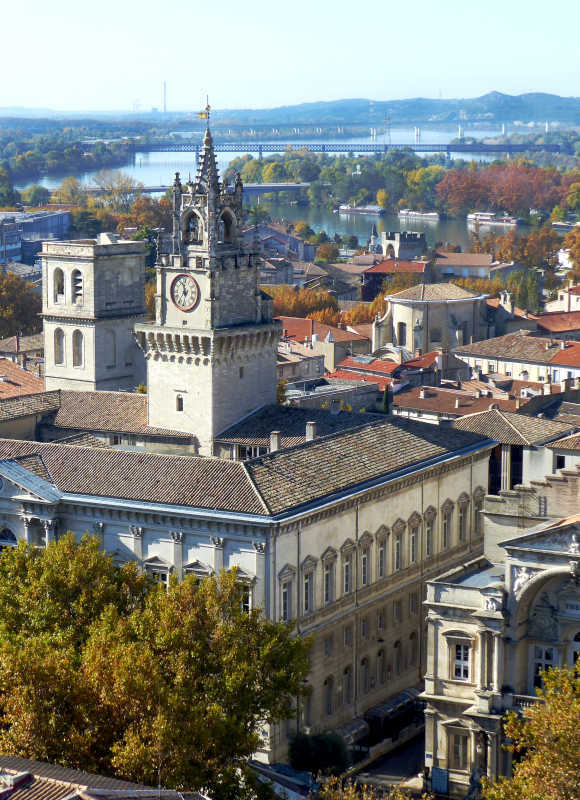 In the foreground is Avignon’s City Hall with its stately clock tower. 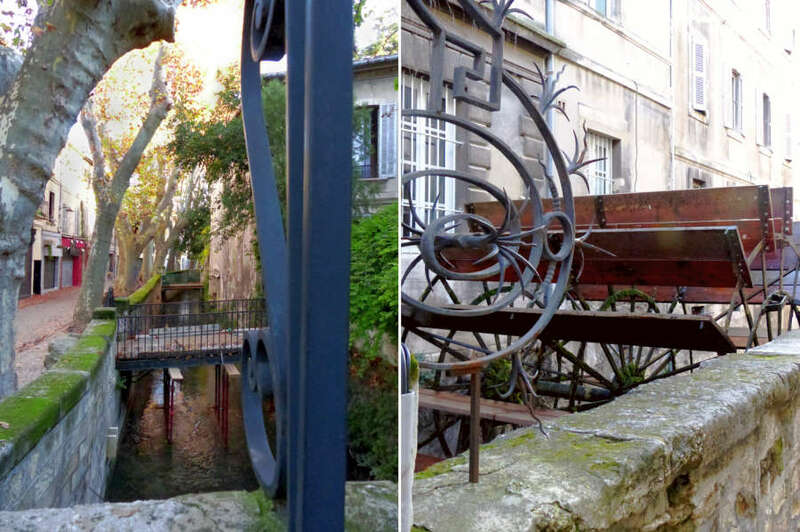 A sense of déjà vu – Avignon also has water wheels and canals thanks to the Sorgue. Rue des Teinturiers (Dyers’ Street), where the textile industry flourished from the 14th century for 500 years, was nicknamed Rue des Roues (Street of Wheels). 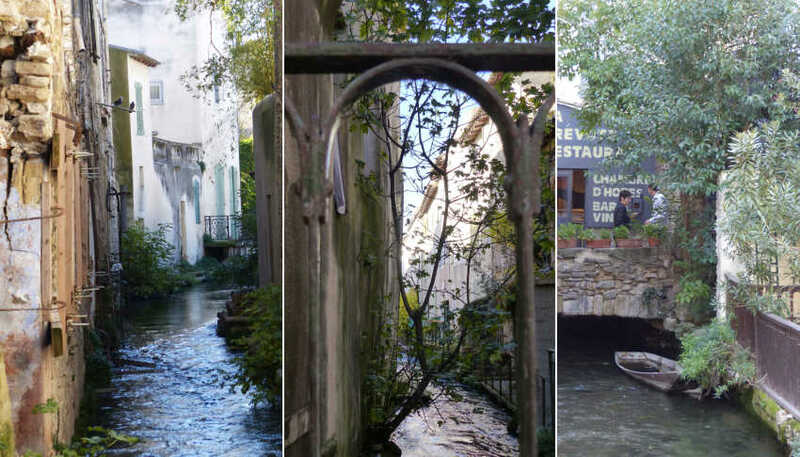 A channel of the Sorgue runs along the street with each water wheel driving a mill. 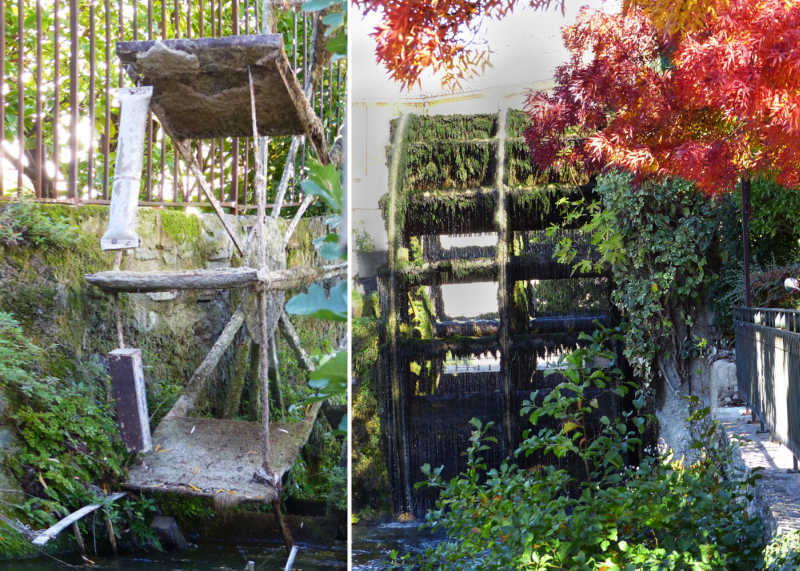 There were once 23 water wheels, now only 4 remain. Is this street art or store signage? 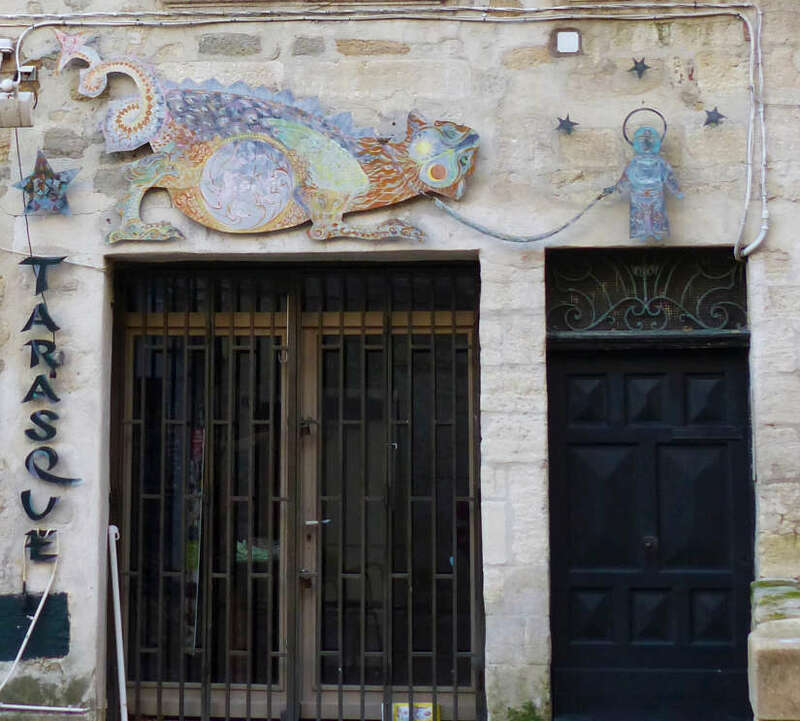 Not sure what it is – I thought this is store signage until I found the Tarasque is a mythical beast from Provence. According to legend, it was a dragon hybrid, part animal and part fish that wreaked havoc in the region, but was ultimately tamed by St. Martha. Recognized by UNESCO as a Masterpiece of the Oral and Intangible Heritage of Humanity, the Tarasque figures prominently in local festivals. Whatever its purpose, the artwork certainly perks up the building façade! 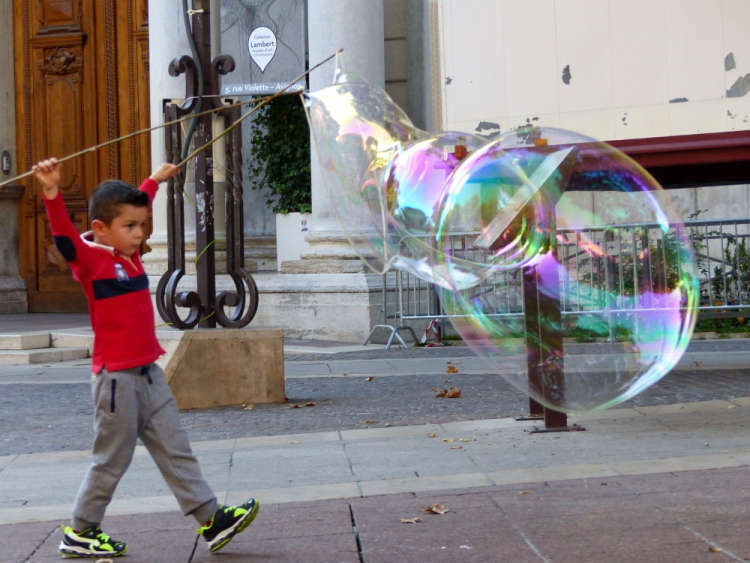 Boy playing with super soap bubbles. The boy and his dad were trying to entice passerbys with their super bubbles in Place-de-l’Horloge (Clock Square) fronting City Hall. Statue of Venus with Swallows in the Jardin du Rocher des Doms. This public garden by cathedral Notre Dame des Doms has lovely views of Palais des Papes as well as the Rhone plains and Mont Ventoux in the distance. 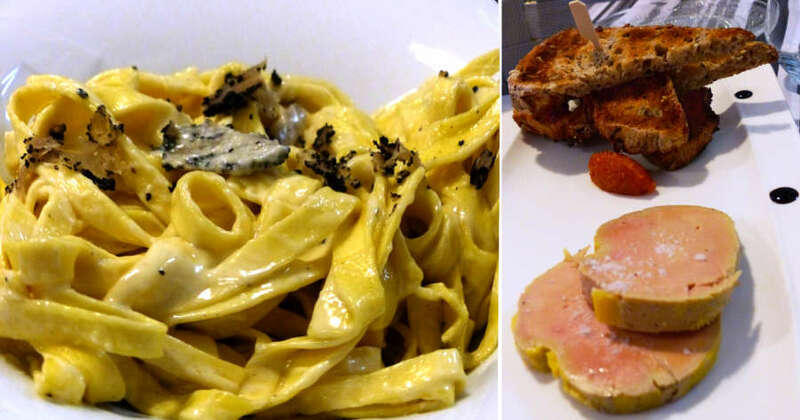 Truffles and foie gras, what more can one ask for?